Anderson. Left a note in the wall? American-Canadian actress Pamela Anderson's first day in Israel came to an end Sunday evening with a visit to the Western Wall in Jerusalem, where she arrived in modest clothing. The visit evoked great interest among many men in the area, who documented the event with their cameras. Speaking at a press conference earlier Sunday, the former "Baywatch" star said she would try her powers of seduction while in Israel on an unlikely audience – ultra-Orthodox Jewish lawmakers. Anderson, an honorary director of People for the Ethical Treatment of Animals, is in Israel to participate in the local version of "Dancing with the Stars." Her work for animals "has been really inspiring," she said. "I feel like I have actually done something." An anti-fur bill has been put on hold in Israel over concerns by ultra-Orthodox leaders that it could impact production of the characteristic fur hats worn by some men from Hassidic sects on holidays and other festive occasions. To combat growing secularization of Jews to European society in the 18th century, Hasidic Jews decided that their way of dress should remain intact and not be influenced by fashion. Descendants of these communities to this day wear the black hats and coats of that period, including, at times, fur hats. Anderson called Israel a "progressive" country because it had no fur farms, and said that it can serve as "an example for the rest of the world." She said she intends to speak about the issue of fur to Israeli religious leaders on her trip. "It's almost 2011. There are so many alternatives to things. We can be compassionate in our choices," Anderson said. She said she tries to incorporate her campaign for animal rights during other "Dancing with the Stars" shows around the world. After enjoying a vegetarian dinner at the luxurious Raphael restaurant in Tel Aviv, Anderson and her entourage traveled to Jerusalem and spent half an hour at the Western Wall. On Monday she was scheduled to tour central Israel and participate in "Dancing with Stars". 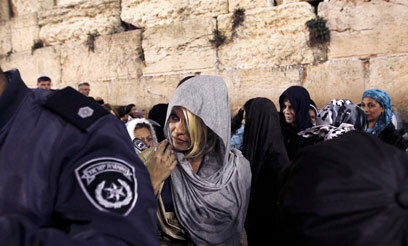 See all talkbacks "Pamela Anderson visits Western Wall"